On Tuesday night's episode of "The Voice," eight became six as the remaining contestants discovered who would be moving on during the show's live eliminations. Before saying goodbye to two singers, viewers said hello to Sheryl Crow as she treated fans to her newest single "Easy." The nine-time Grammy Award-winning singer has shared the stage with everyone from the Rolling Stones to Michael Jackson but it was Blake Shelton's team that joined her during this very special performance of the song. Dueling DuetsAnd the collaborations didn't end there. Between results, opponents were paired up for an evening full of duets. It all kicked off with Michelle Chamuel and Judith Hill's rendition of Calvin Harris and Florence Welch's "Sweet Nothing" and was followed by other noteworthy performances including the Swon Brothers and Sasha Allen's cover of Jason Aldean and Kelly Clarkson's "Don't You Wanna Stay" and Danielle Bradbery and Sarah Simmons' performance of Christina Perri's "A Thousand Years." Four Eyes on the PrizeAfter rocking Michelle Chamuel's trademark black-rimmed glasses during Monday evening's live rounds, Usher paid homage to his last contestant on Tuesday by donning the specs again. And it wasn't just her coach who was getting in on the action either. After learning Chamuel would be moving on in the competition -- "It's crazy! I'm just very, very grateful! Thank you so much," she said -- Social Media Correspondent Christina Milian shouted out Usher's innovative hashtag (#4eyesontheprize) and then slipped on a similar pair of bifocals. Voice Confessionals Results weren't the only thing revealed Tuesday night. All four judges and their acts sounded off during "Voice Confessionals," divulging some secrets about themselves and the other contestants. What juice was spilled, you ask? Not only did we learn about Chamuel's love for raw lettuce, but Usher confessed his admiration for women's feet ... but maybe not Shakira's, especially after his fellow coach showed of the bottoms of her dirty tootsies, explaining that you'll rarely catch her wearing shoes. Final FarewellsDuring the show's remaining minutes, host Carson Daly announced which of the current contestants would be moving on. 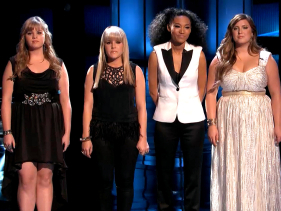 Among the four awaiting their fate was Holly Tucker, who just moments before learning her status said if she returned next week that she would show the audience more of what she did Tuesday night, referring to her performance of the Band Perry's "Done," — "That was fun for me. Tucker said. "I really want to show that side of me more." Luckily for the full-time Baylor University student, she'll get that opportunity since America's final saves were given to both her and Amber Carrington. Unfortunately for Adam Levine, that meant he had to say goodbye to Judith Hill and Sarah Simmons, two of his three remaining members.